RTB House is a state-of-the-art retargeting platform that is powered by deep learning, enabling digital marketers and advertisers to fully utilize personalized display advertising to achieve their goals. With RTB House, advertising agencies and professional online marketers are able to deliver digital ads to audiences who can quickly and easily associate with the message, thus assuring a very high chance of conversion. RTB House does this by developing and utilizing in-house digital advertising technologies that identify and track web users, monitor their online shopping behavior, dig online purchase history and previous interactions. The software then analyzes the information and based on the data gathered and evaluated, displays personalized ads to the users, resulting in higher conversion rates, more revenue, and better ROI. RTB House gives you a retargeting platform that easily scales to what your needs and requirements are. It also provides you with that high degree of transparency to help you see things and make quick yet critical adjustments to your digital campaigns. With RTB House, you have a solution greatly improves the efficiency of your marketing funnel with the help of custom journey scenarios. You have a set of tools that are readily available to you, allowing you to tailor your retargeting strategies to further extend the reach of your campaigns and touch more customers with personalized digital ads. You can segment your audience based on different industries. RTB House lets you set specific goals and send tailored creative displays to customers based on the industry, ensuring that they receive ads of products that they actually want or need. Thanks to its deep learning algorithm, you are able to create and implement campaigns that contain tailored content that fits to your audience’s profile. With deep learning, your campaigns become 50% more efficient in contrast to digital displays that are created using conventional machine learning methodologies. Whenever you need to see how your campaigns are performing, RTB House delivers real-time reports. All your stats and goals are monitored 24/7. Whether you just want a general overview of your campaigns or require deep campaigns analytics, you can trust RTB House to supply you with the data you need. What Problems Will RTB House Solve? ZALORA is Asia’s online fashion destination. Founded in 2012 by Rocket Internet, the company has a presence in Singapore, Indonesia, Malaysia & Brunei, the Philippines, Hong Kong, Taiwan, Thailand and Vietnam offering an extensive collection of top international and local brands, as well as apparel, shoes, accessories, and beauty categories for men and women. Personalization is a huge part of customer experience. Today’s consumer expects the ads shown to them online to be relevant to what they are currently interested in, as well as pertinent to their personal taste and style. 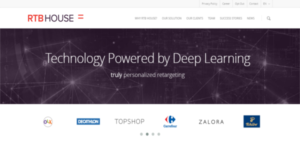 Thus, ZALORA was looking for a retargeting provider that would be able to run large and highly effective personalized retargeting campaigns in different APAC markets, on a performance-based model. RTB House launched separate campaigns for new customer acquisition and for existing users, covering 6 countries in APAC – Singapore, Malaysia, Indonesia, the Philippines, Taiwan and Hong Kong. Due to their solid effectiveness, RTB House was able to launch those campaigns in 2 additional markets, Thailand and Vietnam, belonging to Central Group, Thailand’s largest retail conglomerate. With the help of RTB House’s advanced retargeting technology, users who shop on ZALORA are served exclusively personalized adverts and offers based on their unique fashion and shopping interests. More than 0.5M sessions delivered every month. Conversion value increased by over 30% (Compound Monthly Growth Rate). 498% ROAS from combined retargeting activities across all markets. OLX is a global classifieds platform with almost 260 million users and over 19 billion page views per month. In Romania, OLX.ro is the biggest classifieds platform according to user choice. The challenge was to increase the number of messages exchanged between online buyers and sellers as well as to split the advertising campaign into mobile and desktop channels. RTB House recommended its personalized retargeting solution dedicated to well-established e-commerce players. The company prepared various retargeting scenarios adjusted to client-specific goals. This allowed highly tailored creatives to reach individual web users real-time, based on their unique product preferences and search history. STEP 1: A user visited OLX.ro and checked for something interesting, but didn’t contact any seller to find out more details and left the website. STEP 2: Then, RTB House displayed such user its unique personalized banner with OLX.ro products. STEP 3: After clicking on the advertising banner, the user was redirected to the OLX.ro website, where he could contact the sellers. OLX’s banners were displayed almost 155 million times on desktop and over 41 million times on mobile devices depending on the device type that was used to visit OLX’s site. RTB House campaign reached Client’s business goals. It generated over 1.7 million of clicks via desktop and over 550.000 clicks via mobile channels. O2 is one of Slovakia’s biggest and most prominent mobile service providers. Originally known as Telefónica, O2 began in Slovakia with commercial services on 2 February 2007, with about 600,000 pre-registered users and 400,000 Slovaks actively using the O2 service. The operator now has 1,800,000 active SIM cards. Owned by PPF, the company is a subsidiary of O2 Czech Republic. The telecommunications industry is a highly competitive environment. Only those who are able to keep up a consistent presence can succeed. O2 wanted to increase brand visibility among their target group, hence the company decided to focus not only on those users who were highly likely to convert and come over to O2 but also on those who were only visiting the website and not necessarily considering a purchase. The retargeting campaign, implemented by RTB House, was designed to increase web traffic while maintaining the conversion rate. RTB House analyzed and targeted users based on their potential to make a purchase. The software helped divide them into 3 segments: visitors, users who added products to the shopping cart and users that have already actually made a purchase. The last part was the preparation of various banners sets and advanced retargeting strategies based on those segments. Thanks to RTB House’s advanced retargeting campaign, O2 reached 0,35% CTR. The software displayed 5.5 million banners every month, effectively redirected users to the O2 website, increased traffic and boosted their customer conversion rate. Each user segment was targeted individually, using three special sets of banners. As a result, the client´s budget was utilized effectively and the best possible outcome for the campaign was attained. Flyin.com is the number one Online Travel Agency in Saudi Arabia. It is the one-stop-shop for the Modern Traveler, both for flights and hotel bookings. Flyin.com wanted to tie up with a retargeting partner that could help them to re-engage in-market travellers by showing them highly relevant offers at the right time. They wanted to increase the number of flight bookings while maintaining high ROAS. RTB House launched dynamic display retargeting campaign where every past visitor was shown personalized offers comprising of travel destinations that might interest them the most and inspire bookings. An RTB House’s technology powered by deep learning automatically formulated a tailor-made bidding model and offer-recommendation strategy based on user’s behavior and travel preferences. User’s engaged with Flyin.com via various devices that included mobile phones, tablets, PCs and game consoles. Thanks to good campaign’s optimization conversions were maximized while maintaining client’s high ROAS goal. The ROAS (Return on Ad Spend) of the campaign exceeded 14:1. Approx. 90% of re-engaged users were New Potential Buyers (people who have never purchased anything from a client but might have put products in a basket in the past). 74% average campaign’s Revenue Growth (month-on-month). 33% increase in Retention Rate. 23% increase in overall Conversion Rate. Every organization has different requirements and requires a software that can be personalized for their size, type of staff members and clients, and the particular industry they are in. For these reasons, no software can provide perfect tools off-the-shelf. When you look for a software product, first be sure what you need it for. Read some RTB House reviews and ask yourself do you desire basic functionality or do you require complex functionality? Are there any industry-specific tools that you are seeking? Obtain the answers to these questions to aid your search. There are lots of factors that you need to mull over and these include your finances, particular business wants, your company size, integration requirements etc. Take your time, check out a few free trials, and finally select the system that provides all that you want to improve your organization efficiency and productivity. How Much Does RTB House Cost? Contact RTB House for more product details and enterprise pricing options. Set up a free consulation today. We realize that when you make a decision to buy Demand Generation Software it’s important not only to see how experts evaluate it in their reviews, but also to find out if the real people and companies that buy it are actually satisfied with the product. That’s why we’ve created our behavior-based Customer Satisfaction Algorithm™ that gathers customer reviews, comments and RTB House reviews across a wide range of social media sites. The data is then presented in an easy to digest form showing how many people had positive and negative experience with RTB House. With that information at hand you should be equipped to make an informed buying decision that you won’t regret. What are RTB House pricing details? What integrations are available for RTB House?